Om is universal Vibration. The Sriyantra is believed to be the visual representation of this universal vibration OM. Indeed Dr. Hans Jenny claims to have produced an exact replica of the Sri Yantra in 1967 when the OM Mantra was sung into a "tonoscope, a device used to visually represent sounds on a video screen. Just as to how the ancients were able to produce such a perfect visual representation of the sacred Mantra OM remains a mystery. Om is the best name of God because its vibrations bless the devotees with positive energy there by activating our chakras. In Hindu tradition goddess Tripusundari is considered as the most superior expression of divinity that is why the image of Sriyantra of this goddess is formed on astral plane when we chant Om. 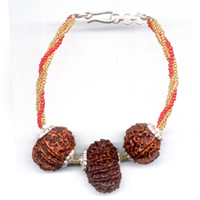 It means that Om is goddess Tripursundari's form. Om is recited in the beginning of all Mantras. One gets blessed with purity of mind, creativity, intelligence, knowledge, protection, attraction and prosperity by reciting it continuously. 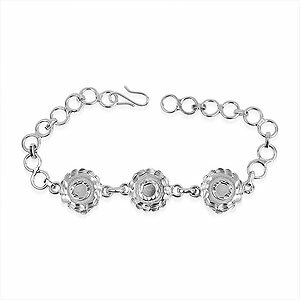 This specific Om bracelet made of Gold is surrounded by small diamonds. 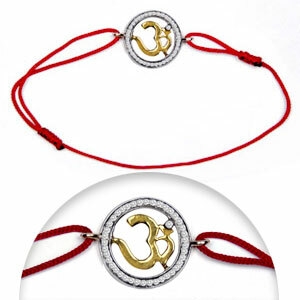 This Om bracelet representing the cosmic vibration can be considered as a symbol of intelligence, cosmic knowledge, purity, bliss, good luck & wealth. 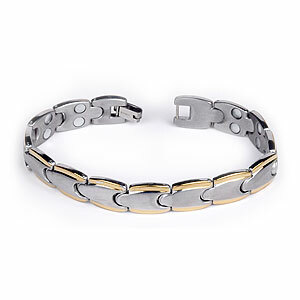 You can wear it in a thread or chain of silver or gold as per your wish.